Why do you have a big nose? Submitter: Here are a couple of scans of a book that, yes, we still own. I can’t help but hear the title announced in a Mafia guy voice. And how do they pay? See the killing rack – yikes! It is a 1946 copyright (1972 printing); I’m sure some things have changed in the pigeon raising business – and not that many people actually eat squab anymore. 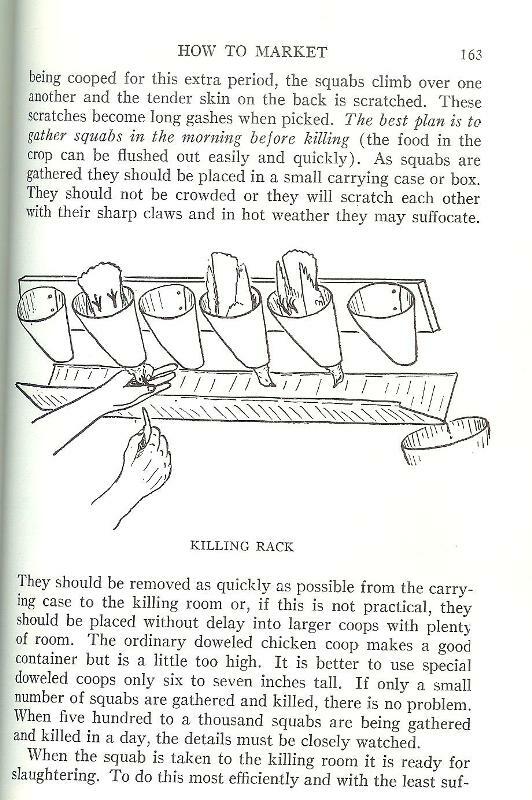 Holly: The last line here, “When a squab is taken to the killing room it is ready for slaughtering.” IT begs to differ. Next Post:Why do you have a big nose? LOL! I had squab once. I was young, and trying to be trendy. It looked like a tiny little turkey. When the waitress brought my plate out, I took one look at it and started to laugh. There was not much to it. Mostly bone. But it made a great memory! I subscribe to this blog through Google reader and scrolling though I came to the picture of the cover and thought it was some sort of cheezeburger blogs picture. I almost ALMOST had baby pigeons in France (pigeonneaux) but I was in the middle of reading Pigeons by Andrew D. Blechman and I think my host father bought them just to rile me. I regret not trying at least one. They also still looked just like little baby pigeons so that put me off. Actually squab is making a comeback. The MasterChef television series has used it as an ingredient a few times in challenges, and butchers have reported a surge in orders from the public since. 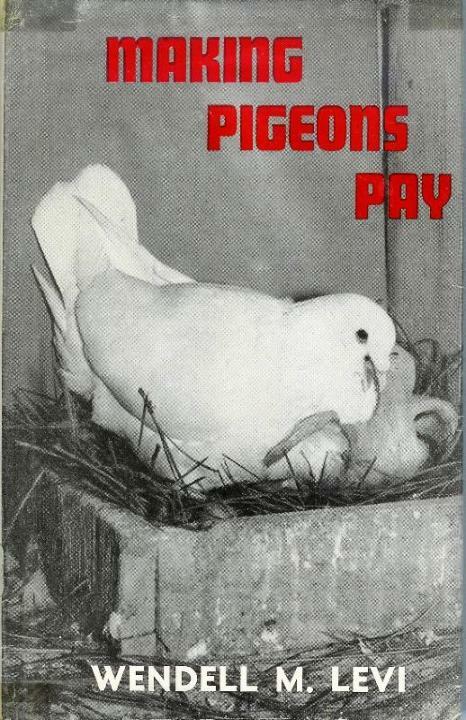 If you were producing at the level of 500 – 1000 pigeons, would this book really be useful? There is an episode of Two and Half Men that talks about squab. I didn’t realize it was pigeon. Wouldn’t eating a pigeon be like eating a Cornish Game Hen? I have a small collection of books like this. Many of them made a come-back in the ’70s when the “back to the land” movement had another cycle. My favorite is Five Acres and Independence. The “killing rack” doesn’t bother me — it looks more human than simply twising their necks. And there’s no point in being fussy about these things if you’re going to eat meat at all. We used to eat pigeon/dove pretty regularly when I was growing up – my father liked to hunt the wild ones. (In the country, not the ones in the city that have been snacking on cigarette butts and discarded gum.) It’s a little gamier tasting than Cornish hen, but not much different. The killing rack looks like a miniature of the turkey-killing apparatus that Sarah Palin was interviewed in front of a couple years back. I learned all I need to know about making pigeons pay from Tom Lehrer. Anyone else thinking of Goodfeathers from Animaniacs? I’ve had squab more than once, and rather liked it, but the poulterer has gone out of business (sickness, no successor) and they’ve become hard to get. Anyway, as little birds go, quail are nicer. Here in rural France, pigeonneau are a treat and a delicacy, and a roasting bird is expensive – up to 15 euros at times. I have had them served at a very nice restaurant in Brive la Gaillarde (the chef there is amazing), and they were delicious. The legs can be a bit tough and stringy due to the tendons (not unlike pheasant), although the thighs are very good and juicy. The main breast meat needs to be cooked with respect so it doesn’t become too dry. My parents had the misfortune to eat mature pigeon and said it was like trying to chew rubber – stick to squabs! What is Bert going to do now that this book is gone? Oh wait… internet! I loved the title, then realized it “must” be about raising carrier pigeons. Au contraire…I live in an area where quail hunting is very common. Had one about 19 years ago; made me so sick I’ve never even considered anything like it again. Like a good Chic-Fil-a Spicy Chicken Sandwich, though, or Zaxby’s. I was at a very fancy dinner party once where squab was served. The lone child at the table refused to eat hers, as she was positive she was being served parakeet. The title sounds like a book about stool pigeons, cement shoes, and that sorta thing. I first read the title and thought it was about how to get revenge for all the times pigeons pooped on your car. I was kind of disappointed as I was hoping the book might offer me a solution for the damn pigeons that keep pooping on my laundry! Maybe next time they annoy me I shoud just grabbed one and serve it for dinner. There are days when I feel I am closely watching over 500 to 1,000 squabs! I guess I expected this book to be about making money off a carrier pigeon service. I had no idea people ate them! …But now I’m just wondering if pigeon sailors would squab the deck. LOL! I was thinking of the Animaniacs, too. I’m actually kind of sad I didn’t like squab when I tried it recently. It’s like duck with less meat. i am a pigeon fancier and a vegitarian so i think all meat is wrong, ecspecially squab.